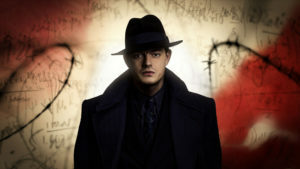 Set in the 1940s, in an alternate world where the Germans won the Battle of Britain, BBC’s new five part series SS-GB follows Scotland Yard detective Douglas Archer (Sam Riley), who is investigating a murder in German-occupied England. The gripping new drama is an adaptation of Len Deighton’s 1978 novel and will be split into five parts. Writers Robert Wade and Neal Purvis both studied Film and Photographic Arts at the University of Kent. Since then they have forged a successful career writing screenplays together, with their first success being the controversial drama Let Him Have It (1991). Both writers have also co-written five James Bond films, including Quantum of Solace (2008) and Skyfall (2012), which was the UK’s highest grossing movie! 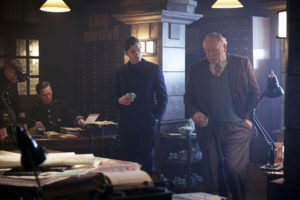 SS-GB brings together a fantastic cast including, Sam Riley (Maleficent, Control), Kate Bosworth (Still Alice, Superman Returns), Aneurin Barnard (Citadel, The Truth About Emanuel), Rainer Bock (War Horse, Inglorious Basterds and Unknown), Jonathan Cass (Transformers: The Last Knight, Kingsman: The Golden Circle), James Cosmo (Braveheart and Troy), Maeve Dermody (Black Water, Marcella), Lars Eidinger (Clouds of Sils Maria, Everyone Else), Kit Connor (Get Santa, Mr Holmes) and James Northcote (The Imitation Game). Exterior street scenes were shot at The Ropery and Anchor Wharf and also around the church and South Stables. The Tarred Yarn store was featured as a mortuary and there was also a small scene in The Commissioners House garden. Set over 80 acres with more than 100 Victorian and Georgian buildings, The Historic Dockyard Chatham is one of Kent’s most popular film locations and has previously been used for the BBC TV series Call The Midwife (2012-present), The Crown (2016) and most recently The Halcyon (2017).